Big kids can still be very cute. We’ve just finished week one of our school holidays. 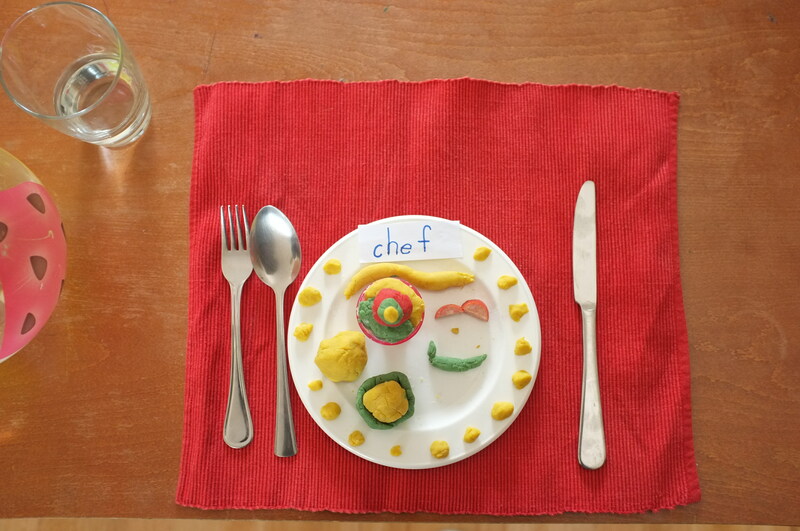 The three school kids devoted one whole day to playing MasterChef with play dough. Seriously, a whole day. I couldn’t believe it. You know your kids aren’t babies any more when they don’t even want you to be involved in their game and it can go on happily for HOURS. They were playing on the back verandah, but it didn’t sound like play. Every time a snippet of conversation drifted by me in the house it sounded really serious. Finally I was invited to come for the tasting and judging. I’m told that these are burgers made with rainbow buns, layers of lettuce, cheese and tomato. There are four handcut hot chips and a small bowl with sauce in the centre. This is a dessert tasting plate with gumballs around the edges, an icecream, a jelly cup, a quenelle of custard, a handmade lolly snake, and a little edible face. There were more dishes, but they got impatient with me taking photos before ‘tasting’. My kids are such MasterChef devotees but I’m becoming increasingly uneasy about them watching the show. Let’s just say there are parental differences involved in their continuing exposure to it (ie. my husband lets them watch it and it’s still the only relatively innocuous thing that all of us can bear to watch together). I once wrote about the reasons I don’t like MasterChef for the Sydney Morning Herald Heckler column. I have even more problems with it now. For one thing it seems as much as sport about getting contestants to break down and cry as it is a cooking competition. I can’t seem to forget that, you know, these are REAL PEOPLE. I fear for some of these people’s mental health. Another thing, and what I wrote about in that column, is how it fosters the whole celebrity culture. If you win a reality TV show then you’ve ‘made it’, you’re ‘somebody’. Give me a break! Are we so insecure and so obsessed with popular culture that we need to be in front of thousands of others affirming and awarding us in order to feel that we’re worth something? That an achievement on a reality TV show is somehow more valuable and real than many achievements in real life? Unfortunately I feel that increasingly for many people, the answer is yes. I was saddened when I read that a former contestant said she signed up for the show to do something that made her feel special and unique. She’s a foster mother and social worker, who obviously didn’t feel very valued in her every day life of generous work and service. Does that say something more about her, or about all of us and what we are valuing in life? As we snuggle on the sofa one evening and watch yet another contestant struggle to keep it together on national TV, while one of the favourites shrugs off the fact that she practically cut her finger off, the older kids tell me that they want to be on the show someday. They expect me to be all encouraging and ‘You go for it!’, and are surprised when I just say, “No way”. No one’s going to break my kids apart like that, and in front of thousands of people. At least not with my permission, and not unless they can afford to pay for their own therapy afterwards. I really wish I’d thought to take a photo of the mess they all made in the process of inventing their creations. 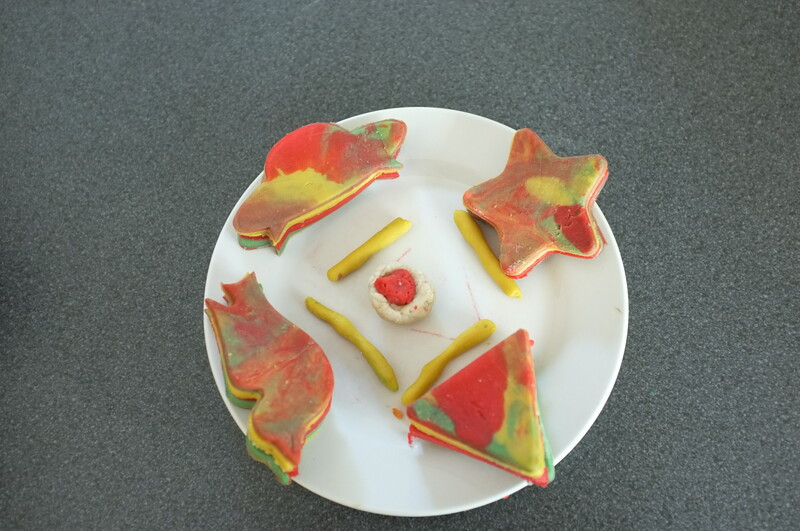 It was overwhelming because along with the play dough they’d used real flour – a lot of it.